The backup job that processes Veeam Agent computers runs on the backup server in the similar way as a regular job for VM data backup. The backup job is intended for protected computers that have permanent connection to the backup server, such as standalone servers and failover clusters. The backup job creates Veeam Agent backups in a Veeam backup repository. In Veeam Backup & Replication, the backup job of this type is also referred to as the Veeam Agent backup job managed by the backup server. To learn more, see Backup Job. The backup policy describes configuration of individual Veeam Agent backup jobs that run on protected computers. 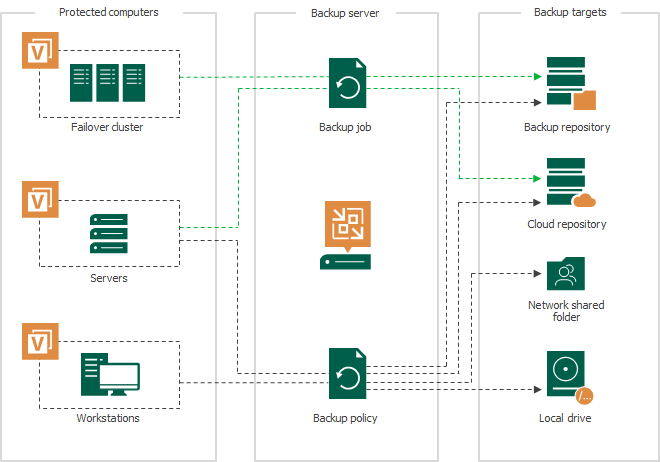 Veeam Backup & Replication uses the backup policy as a saved template and applies settings from the backup policy to Veeam Agents that run on computers specified in the backup policy. The backup policy is intended for protected computers that may have limited connection to the backup server, such as workstations, laptops and so on. You can choose to create Veeam Agent backups in a Veeam backup repository, in a network shared folder or on a local storage of a protected computer. In Veeam Backup & Replication, the backup policy is also referred to as the Veeam Agent backup job managed by Veeam Agent. To learn more, see Backup Policy. Backup jobs and policies that process Microsoft Windows computers. For such Veeam Agent backup jobs, Veeam Backup & Replication offers settings supported in Veeam Agent for Microsoft Windows. Backup jobs and policies that process Linux computers. For such Veeam Agent backup jobs, Veeam Backup & Replication offers settings supported in Veeam Agent for Linux. If a protection group contains Microsoft Windows computers and Linux computers, you can add this protection group to a Veeam Agent backup job intended for any of these types of protected computers. Veeam Backup & Replication will automatically exclude computers of another type from the backup job and processes only those computers that run an OS of the same type. For example, if you add a protection group that contains Microsoft Windows and Linux computers to a Veeam Agent backup job intended for Linux computers, Veeam Backup & Replication will exclude Microsoft Windows computers from this backup job and process only Linux computers within the job. You can include a Microsoft Windows computer of the Server type in more than one backup job managed by the backup server or more than one backup policy. You can include a Microsoft Windows computer of the Workstation type in one backup job managed by the backup server or one backup policy. You can include a Linux computer of the Workstation or Server type in more than one backup job managed by the backup server or more than one backup policy. You cannot include the same computer in a backup job and backup policy simultaneously.